David’s note: TWO people now have gotten 5 certifications in 6 weeks! Does lightning strike the same place twice, or is this something “regular” human beings can do? I guess we’ll find out! Adam, I’m proud of you and I have a feeling I’ll be hearing more achievements from you soon! After starting working with Salesforce for the first time only very recently (this past August), I was inspired to really dig into the platform after attending your Q&A session at Dreamforce. SFDC99 has been a TREMENDOUS resource for me as I began studying at the beginning of the year and after following your recommendations, utilizing the Salesforce Help and Training, and also getting some inspiration from Mayank, I was able to get my first 5 certifications in just 6 weeks! 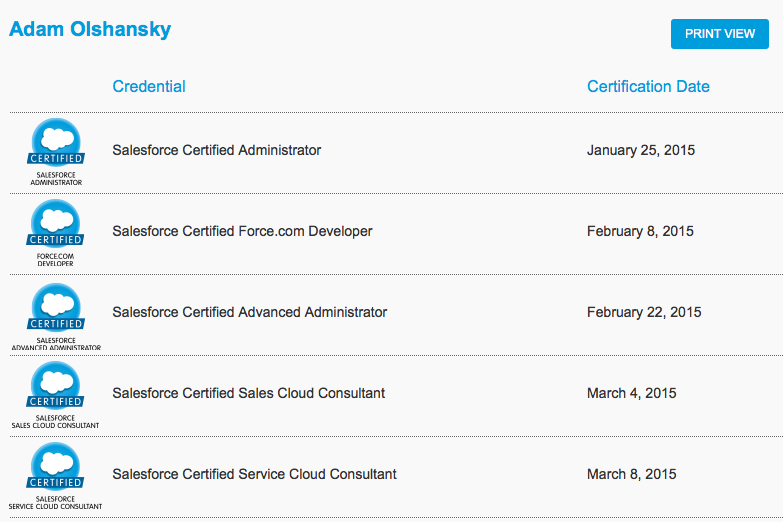 Thanks to your guidance, I am very proud to say I am a Salesforce Certified Admin (201), Force.com Developer (401), Advanced Admin, Sales Cloud Consultant, and Service Cloud Consultant. I’m still in the early stages of my career but have some experience working with Java and am looking forward to start digging into Apex and hope to become a Certified Advanced Developer in the not so distant future! I’ll make sure to check back often for more posts and am hoping to start getting more involved in the vibrant Salesforce community as well. If you have any additional advice, I’d definitely appreciate it. Thanks again for all your help! so cool and awesome.i am indeed happy to have found out sSFDC99.I am planning to take up ADM 201,sales cloud consultant and service cloud consultant. Thanks David.Will keep u posted on the same. Thanks Mayank! Happy to be aboard :) Thanks for the inspiration! Great job Adam! Do you think you can post links to other resources that you had used? It could benefit everyone. Thanks Eli! It’s been a while, hope you’re doing well! For all of you getting all these certifications, has it helped you get new jobs or upgraded your pay?